The Aircraft Accident Investigation Bureau (AIB) is the investigation authority in Ethiopia responsible to the Ministry of Transport for the investigation of civil aircraft accidents and serious incidents in Ethiopia. The mission of the AIB is to promote aviation safety through the conduct of independent, separate investigations without prejudice to any judicial or administrative action consistent with Annex 13 to the Convention on International Civil Aviation. The AIB conducts the investigations in accordance with the proclamation No 957/16 and Annex 13 to the Convention on International Civil Aviation, which governs how member States of the International Civil Aviation Organization (ICAO) conduct aircraft accident investigations internationally. “The sole objective of the investigation of an accident or incident shall be the prevention of accidents and incidents; it is not the purpose of this activity to apportion blame or liability’’. 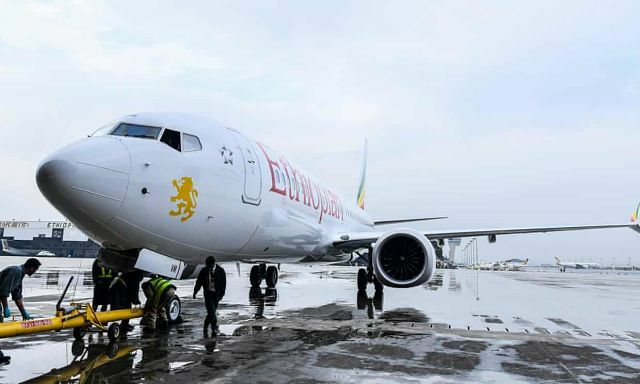 On Sunday 10th March 2019 at around 05:47, FDRE Ministry of Transport and AIB were informed the loss of radio and radar contact with flight ET 302 a few minutes after take-off from Addis Ababa Bole International Airport. As per the Ethiopian Government decision and agreement between the FDRE Ministry of Transport and the French Bureau d’Enquête Analyse pour la sécurité de l’aviation civile (BEA), the DFDR and CVR were read at the BEA facilities at Le Bourget, near Paris, France. Both recorders were transported directly to the BEA under the custody of the State of Occurrence accompanied by members from the IC and readings were performed by BEA personnel in association with and under the direct supervision of the IC. On request of Ethiopia and as per annex 13 article 5.23, BEA has appointed an accredited representative. A Search & Rescue (SAR) team performed search by Ethiopian Air force, Ethiopian Air lines Group and Abyssinian flight service. Search operations were conducted in full coordination with Federal, Regional police and other Government bodies. It was also decided that media relations till the release of the final investigation report were to be handled by the FDRE Ministry of Transport Minister with factual data and information relayed through the IIC directly to the Minister. On March 10, 2019, at about 05:44 UTC1, Ethiopian Airlines flight 302, a Boeing 737-8 (MAX), Ethiopian registration ET-AVJ, crashed near Ejere, Ethiopia, shortly after takeoff from Addis Ababa Bole International Airport (HAAB), Ethiopia. The flight was a regularly scheduled international passenger flight from Addis Ababa to Jomo Kenyatta International Airport (HKJK), Nairobi, Kenya. There were 157 passengers and crew on board. All were fatally injured, and the Aircraft was destroyed. The following is based on the preliminary analysis of the DFDR, CVR and ATC communications. As the investigation continues, revisions and changes may occur before the final report is published. At 05:37:34, ATC issued take off clearance to ET-302 and to contact radar on 119.7 MHz. Takeoff roll began from runway 07R at a field elevation of 2333.5 m at approximately 05:38, with a flap setting of 5 degrees and a stabilizer setting of 5.6 units. The takeoff roll appeared normal, including normal values of left and right angle-of-attack (AOA). During takeoff roll, the engines stabilized at about 94% N1, which matched the N1 Reference recorded on the DFDR. From this point for most of the flight, the N1 Reference remained about 94% and the throttles did not move. The N1 target indicated non data pattern 220 seconds before the end of recording. According to the CVR data and the control column forces recorded in DFDR, captain was the pilot flying. At 05:38:44, shortly after liftoff, the left and right recorded AOA values deviated. Left AOA decreased to 11.1° then increased to 35.7° while value of right AOA indicated 14.94°. Then after, the left AOA value reached 74.5° in ¾ seconds while the right AOA reached a maximum value of 15.3°. At this time, the left stick shaker activated and remained active until near the end of the recording. Also, the airspeed, altitude and flight director pitch bar values from the left side noted deviating from the corresponding right side values. The left side values were lower than the right side values until near the end of the recording. At 05:38:43 and about 50 ft radio altitude, the flight director roll mode changed to LNAV. At 05:38:46 and about 200 ft radio altitude, the Master Caution parameter changed state. The First Officer called out Master Caution Anti-Ice on CVR. Four seconds later, the recorded Left AOA Heat parameter changed state. At 05:38:58 and about 400 ft radio altitude, the flight director pitch mode changed to VNAV SPEED and Captain called out “Command” (standard call out for autopilot engagement) and an autopilot warning is recorded. At 05:39:00, Captain called out “Command”. At 05:39:01 and about 630 ft radio altitude, a second autopilot warning is recorded. At 05:39:06, the Captain advised the First-Officer to contact radar and First Officer reported SHALA 2A departure crossing 8400 ft and climbing FL 320. Between liftoff and 1000 ft above ground level (AGL), the pitch trim position moved between 4.9 and 5.9 units in response to manual electric trim inputs. At 1000 ft AGL, the pitch trim position was at 5.6 units. At 05:39:22 and about 1,000 feet the left autopilot (AP) was engaged (it disengaged about 33 seconds later), the flaps were retracted and the pitch trim position decreased to 4.6 units. Six seconds after the autopilot engagement, there were small amplitude roll oscillations accompanied by lateral acceleration, rudder oscillations and slight heading changes. These oscillations continued also after the autopilot was disengaged. At 05:39:29, radar controller identified ET-302 and instructed to climb FL 340 and when able right turns direct to RUDOL and the First-Officer acknowledged. At 05:39:42, Level Change mode was engaged. The selected altitude was 32000 ft. Shortly after the mode change, the selected airspeed was set to 238 kt. At 05:39:45, Captain requested flaps up and First-Officer acknowledged. One second later, flap handle moved from 5 to 0 degrees and flaps retraction began. At 05:39:50, the selected heading started to change from 072 to 197 degrees and at the same time the Captain asked the First-Officer to request to maintain runway heading. At 05:39:57, the Captain advised again the First-Officer to request to maintain runway heading and that they are having flight control problems. At 05:40:00 shortly after the autopilot disengaged, the FDR recorded an automatic aircraft nose down (AND) activated for 9.0 seconds and pitch trim moved from 4.60 to 2.1 units. The climb was arrested and the aircraft descended slightly. At 05:40:03 Ground Proximity Warning System (GPWS) “DON’T SINK” alerts occurred. At 05:40:05, the First-Officer reported to ATC that they were unable to maintain SHALA 1A and requested runway heading which was approved by ATC. At 05:40:06, left and right flap position reached a recorded value of 0.019 degrees which remained until the end of the recording. The column moved aft and a positive climb was re-established during the automatic AND motion. At 05:40:12, approximately three seconds after AND stabilizer motion ends, electric trim (from pilot activated switches on the yoke) in the Aircraft nose up (ANU) direction is recorded on the DFDR and the stabilizer moved in the ANU direction to 2.4 units. The Aircraft pitch attitude remained about the same as the back pressure on the column increased. At 05:40:20, approximately five seconds after the end of the ANU stabilizer motion, a second instance of automatic AND stabilizer trim occurred and the stabilizer moved down and reached 0.4 units. From 05:40:23 to 05:40:31, three Ground Proximity Warning System (GPWS) “DON’T SINK” alerts occurred. At 05:40:27, the Captain advised the First-Officer to trim up with him. At 05:40:28 Manual electric trim in the ANU direction was recorded and the stabilizer reversed moving in the ANU direction and then the trim reached 2.3 units. At 05:40:44, the Captain called out three times “Pull-up” and the First-Officer acknowledged. At 05:40:50, the Captain instructed the First Officer to advise ATC that they would like to maintain 14,000 ft and they have flight control problem. At 05:40:56, the First-Officer requested ATC to maintain 14,000 ft and reported that they are having flight control problem. ATC approved. From 05:40:42 to 05:43:11 (about two and a half minutes), the stabilizer position gradually moved in the AND direction from 2.3 units to 2.1 units. During this time, aft force was applied to the control columns which remained aft of neutral position. The left indicated airspeed increased from approximately 305 kt to approximately 340 kt (VMO). The right indicated airspeed was approximately 20-25 kt higher than the left. The data indicates that aft force was applied to both columns simultaneously several times throughout the remainder of the recording. At 05:41:20, the right overspeed clacker was recorded on CVR. It remained active until the end of the recording. At 05:41:21, the selected altitude was changed from 32000 ft to 14000 ft.
At 05:41:30, the Captain requested the First-Officer to pitch up with him and the First-Officer acknowledged. At 05:41:32, the left overspeed warning activated and was active intermittently until the end of the recording. At 05:41:46, the Captain asked the First-Officer if the trim is functional. The First-Officer has replied that the trim was not working and asked if he could try it manually. The Captain told him to try. At 05:41:54, the First-Officer replied that it is not working. At 05:42:10, the Captain asked and the First-Officer requested radar control a vector to return and ATC approved. At 05:42:30, ATC instructed ET-302 to turn right heading 260 degrees and the First-Officer acknowledged. At 05:42:43, the selected heading was changed to 262 degrees. At 05:42:51, the First-Officer mentioned Master Caution Anti-Ice. The Master Caution is recorded on DFDR. At 05:42:54, both pilots called out “left alpha vane”. At 05:43:04, the Captain asked the First Officer to pitch up together and said that pitch is not enough. At 05:43:11, about 32 seconds before the end of the recording, at approximately 13,4002 ft, two momentary manual electric trim inputs are recorded in the ANU direction. The stabilizer moved in the ANU direction from 2.1 units to 2.3 units. At 05:43:20, approximately five seconds after the last manual electric trim input, an AND automatic trim command occurred and the stabilizer moved in the AND direction from 2.3 to 1.0 unit in approximately 5 seconds. The aircraft began pitching nose down. Additional simultaneous aft column force was applied, but the nose down pitch continues, eventually reaching 40° nose down. The stabilizer position varied between 1.1 and 0.8 units for the remainder of the recording. The aircraft is completely destroyed. The pilot in command was 29 years old. According to Ethiopian Civil Aviation Authority (ECAA) records, the Captain’s most recent simulator training experience was September 30, 2018, and his most recent simulator proficiency check was October 1, 2018. The captain completed the Ethiopian Aviation Academy on July 23, 2010. A review of the captains training records indicated that he received his 737-800 First Officer type rating on January 31, 2011 and completed his PIC type rating for the 737-800 October 26, 2017. 737MAX differences training on 3 July, 2018. The pilot in command is type rated as a First Officer of the following types of aircrafts: B737-7/800, B767/757, B777 and B787. As pilot in command, he is rated on B737-7/800 and B737MAX. The pilot had a first-class medical certificate with no limitations dated December 12, 2018. A review of the medical exam that resulted in the issuance of this certificate showed no vision or hearing deficiencies, and on the certificate application, the pilot stated he was taking no prescription or non-prescription medications. He reported no medical conditions. The first-officer was 25 years old. According to ECAA records, the first-officer’s most recent simulator event was listed as a proficiency check and occurred on December 3, 2018. His line training/check (conducted in the B737 aircraft) was completed on January 31, 2019. The first-officer had a first-class medical certificate with no limitations dated July 30, 2018. A review of the medical exam that resulted in the issuance of this certificate showed no vision or hearing deficiencies, and on the certificate application, the pilot stated he was taking no prescription or non-prescription medications. He reported no medical conditions. The 737-8 (MAX) is a low wing, narrow body single aisle, jet transport with a conventional tail unit configuration, powered by two high bypass turbofan CFM Leap-1B engines mounted on pylons beneath the wings. The Aircraft is manufactured by Boeing Commercial Aircraft and is the fourth generation of the 737 series. According to The Boeing Company’s website, the Aircraft was designed to carry 162-178 passengers, depending on seating configuration. The 737-8 MAX was launched on August 30, 2017, and type certificated with the FAA on March 8, 2017. ET-AVJ was a 737-8 MAX single aisle transport aircraft configured in a 160 passenger multi-class arrangement manufactured by the Boeing Company and delivered to Ethiopian Airlines on 15 November, 2018. The Aircraft was powered by two LEAP-1B Turbo Fan Engines manufactured by CFM International. The Aircraft had 1330.3 hours with a total of 382 cycles at the time of the accident. The aircraft was fitted with a FA2100 NAND DFDR manufactured by L3-com with part number 2100-4945-22 and serial number 001217995. On 11 March 2019, the DFDR was recovered from the accident site by the AIB. The DFDR chassis with the Crash Survivable Memory Unit (CSMU) attached were transported to the French BEA recorder facility for data downloading. The recorder read-out was performed by BEA (Bureau d’Enquête Analyse pour la sécurité de l’aviation civile) investigators for the Ethiopian Accident Investigation Bureau (AIB) under the authority of Ethiopian investigators with the participation of the U.S National Transportation Safety Board (NTSB), The Boeing Company, U.S Federal Aviation Administration (FAA) and EASA. The memory unit recorded 1790 parameters and approximately 73 hours of aircraft operation, and contained 16 flights, including the accident flight. The aircraft was fitted with a FA2100 NAND CVR manufactured by L3 Communications with part number 2100 1925-22 and serial number 001289168. On 11 March 2019, the CVR was recovered from the accident site by the AIB. The CVR CSMU was transported to the BEA recorder facility for data downloading. The CMSU was found separated from the chassis during wreckage recovery. The read-out was performed by BEA investigators under the authority of the Ethiopian Accident Investigation Bureau (AIB), with the participation the National Transportation Safety Board (NTSB) of United States of America, the Boeing Company, and the Federal Aviation Administration (FAA). The memory unit recorded 2 hours, 4 minutes and 14 seconds of aircraft operation, which contained 2 flights including the accident flight. The accident site was located near Ejere, Ethiopia with a GPS location of approximately 8.8770 N, 39.2516 E.
The Aircraft impacted in a farm field and created a crater approximately 10 meters deep (last aircraft part found) with a hole of about 28 meters width and 40 meters length. Most of the wreckage was found buried in the ground; small fragments of the aircraft were found scattered around the site in an area by about 200 meters width and 300 meters long. The damages to the aircraft are consistent with a high energy impact.  The takeoff roll appeared normal, including normal values of left and right angle-of-attack (AOA).  Shortly after liftoff, the value of the left angle of attack sensor deviated from the right one and reached 74.5 degrees while the right angle of attack sensor value was 15.3 degrees; then after; the stick shaker activated and remained active until near the end of the flight.  After autopilot engagement, there were small amplitude roll oscillations accompanied by lateral acceleration, rudder oscillations and slight heading changes; these oscillations also continued after the autopilot disengaged.  After the autopilot disengaged, the DFDR recorded an automatic aircraft nose down (AND) trim command four times without pilot’s input. As a result, three motions of the stabilizer trim were recorded. The FDR data also indicated that the crew utilized the electric manual trim to counter the automatic AND input.  The crew performed runaway stabilizer checklist and put the stab trim cutout switch to cutout position and confirmed that the manual trim operation was not working. The day of the accident, the operator decided to suspend operation of B737-8MAX. On 14th March 2019, Ethiopian Civil Aviation Authority issued NOTAM regarding “The operation of Boeing B737-8 ‘MAX’ and Boeing B737-9 ‘MAX’ aircraft from, into or over the Ethiopian airspace, which is still active at the date of this report publication.  Since repetitive un-commanded aircraft nose down conditions are noticed in this preliminary investigation, it is recommended that the aircraft flight control system related to flight controllability shall be reviewed by the manufacturer.  Aviation Authorities shall verify that the review of the aircraft flight control system related to flight controllability has been adequately addressed by the manufacturer before the release of the aircraft to operations.